One should not talk about politics or religion in polite company, our parents taught us. Contentious subjects like these make people feel uncomfortable, especially since it is to be expected that opinions differ greatly. Yet the contentiousness of topics like politics or religion pales in comparison to the contentiousness of the topic of socioeconomic class. So strong is the aversion to this topic that even mentioning it is often seen as an effort to instigate class struggle. As a result, while politics and religion can be discussed outside of polite company, the topic of class is off limits everywhere. Now try discussing class and religion! This may not be surprising in the United States. After all, Americans are conditioned to believe that class is an irrelevant topic in a country where managers and workers alike believe that they are middle class. It is surprising, however, to what degree the topic of class is off limits elsewhere as well. Class was the most difficult topic in a series of conferences in China in which I participated recently. In high-level discussions of what the Chinese call "ecological civilization," the conversations ranged from capitalism to socialism and from Adam Smith to Karl Marx. Yet mentioning the topic of class resulted in an odd silence. A Chinese colleague took me aside after one of the meetings and confirmed what others had told me for some time: there is little interest in talking about class even among Chinese Marxists. At this point, I can only speculate about the reasons. One suspicion, though, is that even the Chinese economy has tethered itself to such an extent to an economic elite that addressing the huge and gaps between the classes is a touchy topic. After all, China now has the second largest number of billionaires in the world, slightly more than 200, compared to approximately 600 in the United States. Next are England and Germany with 100-plus billionaires. Not all is lost, however, in the discussion of class. My Chinese colleague mentioned that in China there is some interest in studying the matter of stratification. This is, of course, the typical way in which class is addressed in the United States as well when the topic cannot be avoided altogether. Stratification is a way of addressing the various layers of a society, mostly in terms of differing income levels. Stratification even has a place in everyday conversations when people talk about the lower or upper middle class, or when there is mention of the so-called "poverty line." Some might argue that talking about the various strata of society is a way to keep the discussion of class alive. 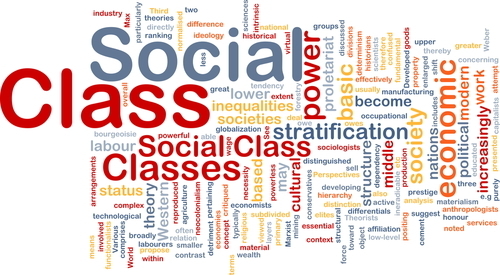 However, a nagging problem remains that those who talk about stratification and the poverty line are unable or unwilling to address: What about the relationship between the classes? This problem manifests itself even in references to poverty and poor people, which frequently fail to address the relations between the poor and the wealthy. Might talking about stratification and poverty possibly be yet another way to avoid talking about class? Not all is lost, though. Conversations about class often emerge in the most unexpected places. One of the wealthiest persons in the world has repeatedly reminded us of the reality of class and the conflictual relationship between the classes. Warren Buffett, when asked about class struggle in the United States, affirmed not only that there was such a thing but that his class was winning it. That was a bold step, which did not sit well with most other billionaires and with the conservative media and political establishments. Even liberals cringed. But Buffett is on to something and the rest of us might benefit from paying attention. Unless we give some thought as to how we are all related to each other and who wins and who loses, a small group will keep winning and the majority--both people and the environment--will keep losing. Religion is another unexpected place for the discussion of class. There are various religious traditions that care about class, some of which are currently being revitalized and reclaimed (see the book Religion, Theology, and Class: Fresh Engagements after Long Silence, ed. Rieger, Palgrave Macmillan, 2013). Much is at stake, as the realities of class and class struggle are not just matters of economics and politics but also of culture and deeply held beliefs. Realities of class, invariably but mostly unconsciously, shape the way people think about God and the world. Is God a 1 percenter, as many people of faith intuitively assume? Or is God taking the side of working people and the proverbial 99 percent? What does all this say about how we see the world? Various religions give answers that may be surprising. In Judaism, God sides with the Hebrew slaves against the Egyptian taskmasters in the Exodus. In Christianity, God becomes human in the form of Jesus who starts out as a construction worker and never severs his ties from working people. In Islam, God is constantly concerned that working people are treated with fairness and justice. Such positions are at the core of these religions and their views of the world, yet they share the fate of the current lack of the discussion of class. Even the most devout people often seem to be unaware of what their religions have to say about these matters and thus miss out on a deeper understanding of God and the world. It seems safe to say that there were few times in the past when people were so oblivious to class differences. Peasants in the Middle Ages and workers in the early days of industrialization, for instance, would have understood the barriers that separate master and slave and boss and worker. Ironically, the current obliviousness to class comes at a time when the gaps between the 1 and the 99 percent are widening and the rising economic tide fails to lift more and more people, with social mobility being more of a dream than a reality. Why not use all the help we can get to understand what is going on? Perhaps then we will also develop some sense of what to do about it as well.